Places to see at Rashikbill: The Lake located in the middle of the forest is a beauty spot in the body of Rashikbeel. The lake features sweet water fishes in abundance. The Kutiputti and the Borali that are two popular varieties of fish in North Bengal are found in this lake. 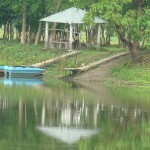 Large Aquarium, Crocodile Rehabilitation and Dear Park are attractions in the heart of Rasikbeel. The Deer Park with above fifty deer is a suitable place to roam or relax. The park with movement of deer and the fluttering of birds on the bank of the lake is nice spot to make much of your leisure. There are also a python house, a leopard house and a Tortoise house to visit. Apart from all these Rasikbil is famous for bird watching activities. Numerous local and migratory birds make their nests at Rashikbeel during different times of the year. Nearby attractions of Rashikbill: Nearby attractions of Rashikbeel are no less attractive than attractions of Rashibeek itself. The Baneshwar temple and the Madan Mohan temple in the town of Cooch Behar are recommended for history lovers to visit. The Royal Palace is the focus of attraction with tourists to Rashikbeel. Tourists whose cup of tea is adventure love to explore the dark and deep forests full of wild animals and birds. The forests teem with trees such as kadam, minjuri and sishu. Things to do in Rashikbill: Bird watching and boating in Rashikbil is the most popular activity. Boating in the lake is a fetching attraction of Rashibill. Being in a boat on water amidst greenery of nature is an ethereal experience that takes you away from the cares and worries of earthly life. The forests around the lake are hub of beautiful and colorful birds that are rare to be found in other parts of North Bengal. You will see here rare birds such as storks, ibises, cormorants and spoonbills and common birds such as parrots and kingfishers. Rashikbeel is a plethora of water birds such as Common Teal, Shoveler, Pintail, Lesser Whistling Teal, Red Crested Pochard, Northern Lapwing, Little Cormorant, Gadwall, Pied Kingfisher, Large Cormorant, Small Blue Kingfisher and Wingeon Duck. How to reach Rashikbill: You can easily reach Rasikbill from the town of Tufangang. It will take you only one and a half hour to reach the place by car. The New Cooch Behar Railway Station is the nearest railhead to Rasikbeel. It is only 35 kilometers from the station. Car service to the place is available from the station. Best time to visit Rashikbill: The best time to visit Rashikbill is from March to June and from September to December as during these times the place is in good favor of weather. If you are fond of birdwatching then the best tie to visit Rashikbeel to see migratory birds nesting here is between October and February. Lodging and Dining facilities at Rashikbill: Rashikbill offers Forest Department cottages and large dormitories for accommodation at Rashikbill. Many tourists also stay at Cooch Behar and visit Rashikbill for day trips.